"Geocache and discover public art in North Vancouver", says Lori Philips of the City of North Vancouver Public Art Program. 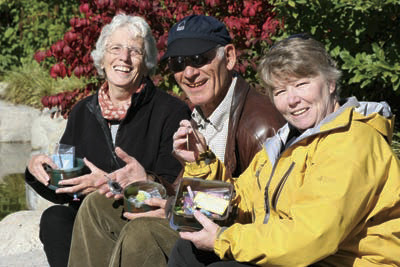 Fans of the great outdoor activity, geocaching, are excited about new locations around the North Shore. Thanks to the efforts of the City of North Vancouver Public Art Program 10 brand new geocaches will be placed in late October this year. They will be stashed near some of the city’s less known public art pieces to help the public discover those hidden items of culture in this beautiful city. So how do you find them and what the heck is geocaching? Geocaching is one of the fastest-growing sports/adventure/hobbies in the world today. It is a family-friendly, vacation-friendly activity that involves using satellite technology to look for hidden treasures. More importantly, geocaching is about finding new places you can explore, that you would never have discovered unless someone took you there. 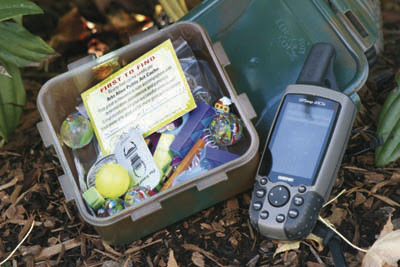 It involves taking the locations of the cache (a waterproof plastic box containing information about the area, a log book and goodies) from internet websites like www.geocaching.com and tracking them down using a hand held GPS (Global Positioning System). A GPS is a handheld device that shows your exact latitude and longitude coordinates anywhere on earth by triangulating from several satellites. There are over 400,000 geocaches around the world and more are being placed every day. I can't tell you how pleased the geocaching community is to see the City of North Vancouver participating in the sport. The Public Art series has created quite the buzz. Although the Public Art caches have been available for a short time I've already received emails on the topic from all over the Lower Mainland, Washington State, Alberta and New South Wales, Australia. North Vancouver entered into geocaching at the right time. It will go down as a Canadian Geo-friendly city along with Canmore, Alberta and Wilberforce, Ontario. As geocaching becomes increasingly popular, geo-friendly cities will benefit in the form of tourism. Geocaching enthusiasts always like to hunt down a few quick caches when travelling to cities for conventions or other business. They do not always have an automobile at their disposal. For this reason, geocachers always look for hotels around "geo-hotspots." The Lonsdale Quay area, with many geocaches within walking distance, is turning into Vancouver's hot spot. The city of North Vancouver should witness an increase in geocaching related hotel visits. For people that live in the lower mainland, North Vancouver has and will continue to be a geocaching destination. It is where geocachers will plan daytrips, fill their cars with gas and buy lunch. I've been to all the caches in the Public Art series and I must say I'm quite impressed. I loved the cache in the "nut" and the granite living room with children's art was amazing. I was sad that the living room was in such an obsure little park. It should be in a place where more people will see it. But that is what the geocaches will do. They'll bring people to parks they would not normally visit. For bringing me to these places, I thank you. It's my hope you continue with the series. After looking at the Public Art registry, there doesn't seem to be a lack of public art in North Vancouver. If there is anything the BCGA can do to help, please feel free to ask. We enjoy working with all levels of government to enhance the geocaching experience.